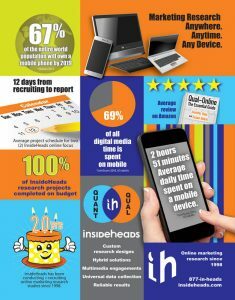 InsideHeads designs + conducts custom marketing research studies online. Decades of diverse experience and proprietary, user-friendly interview platforms make InsideHeads the best choice for your online marketing research studies. Choose InsideHeads for keen, actionable insights to your most paralyzing marketing questions. With happy clients spanning industries, and the globe, for more than 20 years, InsideHeads has the skills and tools needed to make your study a success. InsideHeads also provides free training and affordable ad hoc support for qualitative researchers looking to DIY. I want to be a part of your research team. Joining the InsideHeads Online Research Panel is free! On this page, scroll down to the Sign Me Up link. That will take you to a short online form. Once submitted, membership in the panel will position you for consideration and possible selection to participate in online research studies. If you participate you’ll receive cash for your time and opinions. Please let me join your research team! I have left 2 comments, how many more do you require? Please let me join the research team members in providing some idea. Joining the InsideHeads Online Research Panel is free! On this page < http://insideheads.com/insideheads-research-panel/>, scroll down to the Sign Me Up link. That will take you to a short online form. Once submitted, membership in the panel will position you for consideration and possible selection to participate in online research studies. If you participate you’ll receive cash for your time and opinions. I would like to join the panel. Most definitely want to join!! Please let me join the panel,thank you. looking forward to join and give ideas to your research team. I am in the education field and would like to participate in your Online Panel Research. Hi Janet, thanks for your interest. Joining the InsideHeads Online Research Panel is free! On this page < http://insideheads.com/insideheads-research-panel/>, scroll down to the Sign Me Up link. That will take you to a short online form. Once submitted, membership in the panel will position you for consideration and possible selection to participate in online research studies. If you participate you’ll receive cash for your time and opinions. Hi Muhammad, thank you for your interest. Joining the InsideHeads Online Research Panel is free! On this page < http://insideheads.com/insideheads-research-panel/>, scroll down to the Sign Me Up link. That will take you to a short online form. Once submitted, membership in the panel will position you for consideration and possible selection to participate in online research studies. If you participate you’ll receive cash for your time and opinions. 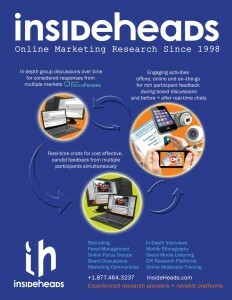 Hi Shaukat, joining the InsideHeads Online Research Panel is free! On this page < http://insideheads.com/insideheads-research-panel/>, scroll down to the Sign Me Up link. That will take you to a short online form. Once submitted, membership in the panel will position you for consideration and possible selection to participate in online research studies. If you participate you’ll receive cash for your time and opinions. Hi Edward, thanks for your interst. Joining the InsideHeads Online Research Panel is free! On this page, scroll down to the Sign Me Up link. That will take you to a short online form. Once submitted, membership in the panel will position you for consideration and possible selection to participate in online research studies. If you are selected + participate you’ll receive cash for sharing your time + opinions with us. I would like to be a part of your research team! I am trying to sign up with you however their is NO sign me up link on this page as you have said to scroll down to??????????? Hi, registration in the InsideHeads research panel is free, just scroll down on this page and click on Sign-up. Good luck! Natalie, you can! Go to this page, scroll down and select Sign-Up. Good afternoon Anthea, registration in the InsideHeads Online Research Panel is free, just go to this page, scroll down and select Sign-Up. Good luck! Good evening, Martina, we’d love to have you! Please click on the Sign Up link on this page to register and be eligible for selection. Good luck! Join the panel for free! Just click on the Sign Up link on this page to register and be eligible for selection. Good luck! Hi Lauren, you can join absolutely free, just click on the Sign Up link on this page to register and be eligible for selection. Good luck! And you may! Simply click the Sign-Up link on this page and you’re on your way. Good day, Minako, you may! Go to this page and select the Sign-Up link to register. Hi Miriam, thanks for your interest! Joining the InsideHeads panel is easy, just go to this page and select the Sign-Up link to join. Cheers! I want to join in !! Hi Yandri, it’s easy! Click on the Sign-Up link on this page and begin the free process of registering. Hi Mariam, thanks for your interest! Consumers are free to join the research panel, just click on the Sign-Up link on this page. The InsideHeads DIY training programs are for marketing research professionals who are looking to conduct and moderate focus groups for their clients. InsideHeads often recruits for our partner studies as well. As a member of the InsideHeads panel, you’re eligible for all sorts of opportunities to participate in research studies and make money. I’ve always wanted to be included in something like this. I want to join of insideheads research Team. I would like to join the panel. Thank you! Would like to join your team. How do I go about it? Hi there, I am interested in joining your Online surveys for cash. What do I do? I wan to be part of the team. I am retired and have plenty of time to devote to surveys. I have the time and would love to take part in surveys, also, I could do with earning some money. It would be a privilege to be a member of your Research Team. I want to join in ! Please add me to your membership. i will be interested in joining and taking cash paying surveys online. Hi Dorothy, if you’re registered, that’s how we know to contact you as research studies come up. Good luck to you! Hi Zelda, I can’t sign you up, but you can sign yourself up 🙂 Register for free by clicking the Sign-Up link on this page and completing the short form with your info so we know what studies you might qualify for. Good luck! Hi Mario! Register for free, just click the Sign-Up link on this page and fill-out the information requested so we may contact you when research studies come up. And you may! Register free to be a member of the InsideHeads Research Panel here by selecting the Sign-Up link and completing the short online questionnaire. Good luck, Christoffel! Hi Herve, to receive opportunities to participate in research studies from InsideHeads, you need to be a registered member of our panel. The good news is that you can register for free! Simply click the Sign-Up link on this page and complete the short online questionnaire. Hi Merle, registration is free and easy, and once you’re in the InsideHeads Research Panel, we can contact you with opportunities to participate and earn cash for your time and opinions. Registerhere, just select the Sign-Up link and complete the form provided. Cheers! Hi Dorothy, thanks for your interest! You may register for free to be a member of the InsideHeads Research Panel byselecting the Sign-Up link on this page and completing the information requested. Good luck! I am willing to be a part of your research team. Looks fun to be a member. Please sign me up. Hi Peter, it’s easy! No cost or obligation, just register here and we’ll keep you updated on research studies in which you may qualify to participate. We don’t pass your info on to anyone else, and we only contact you for research study opportunities. Hi Carol, we are very interested to have you as part of the team! Registration is free, quick and easy at the Sign-Up link on this page here, and we’ll send you an email as studies come up in which you may qualify to participate. Cheers! Hagger, register to be a member of the InsideHeads Online Research Panel here! I want to join your research team. Please sign me up !! Hi Carole, thanks for your interest. I can’t sign you up, but you can sign yourself up 🙂 Click on the Sign-Up link on this page and you’ll be on your way. Easy to do, just select the Sign-up link on the InsideHeads Research Panel page, which will take you to a registration form. Cheers! I want to be a part of your team. Hi Laura, you may certainly join! 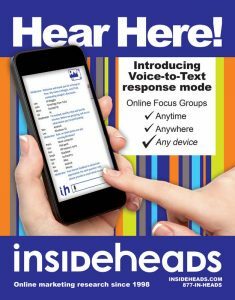 Just select the Sign-Up link on this page to register as a member of the InsideHeads Research Panel. I want to join this awesome community. I would like to be a member. How cam I join? I like to join your company. I want to join and know more. I would love to be part of the research team. Please send links so that I can voice my opinion. And you may! Select the Sign Up link on this page. Good luck! Anyone can join! It’s free, you just need to register – select the Sign Up link on this page. Hi Shaun, I can’t sign you up, but you can sign yourself up! Go to this page and select the Sign-Up link. Hi Mary, thanks for your interest. To join, select the sign Up link on this page, which will bring you to the new member registration page. Cheers! To join the panel, you must complete the registration yourself on this page, just click Sign Up. Cheers! Hi Mheden, thanks for your interest. Anyone can join, it’s absolutely free! Select the Sign Up link on this page to get started. Arman, thanks for your interest. Just click on the Sign Up link on this page and complete the form provided. It takes just a few minutes to register. Good luck! Hi Glenda, thanks for your interest! To join the InsideHeads Online Research Panel, just click on the Sign Up link on this page and answer a few questions about yourself. I want to join if possible. I live in the Philippines. I am interested in doing Surveys. I would very much like to be apart of your research team. Please consider it. Do you actually PAY people who live outside of the USA? Just sign me up, pls. Marina, to signup you need to complete the form yourself. Select the Join Now link on this page and you’ll be on your way! Hi Deborah, if the study is with participants from outside the US, then yes, they would be paid to participate (typically in the native currency). Most of our studies are in the US, Canada, and Europe, but international projects and studies in other areas do come up. Henry, to join the InsideHeads Online Research Panel, go to this page and select the Join Now link. Hi Alison, thanks for your interest. To join the InsideHeads Research Panel, select the Join Now link on this page. To receive surveys and a chance to qualify for online focus groups, register on this page by clicking the Join Now link. would like to participate in your market research surveys and focus groups. I would like to join your network and research team. I would like to join. Thanks. Please register my name on your group of surveyors. I want to be apart of your research team please. Seems interesting so I would appreciate being a member of ‘Inside Heads’. Thank you!! Can i join,i want to participate and to learn..
Let’s me part of you panel! I would like to be apart if your survey team. I hope this is for real that is why I’m joining as there are scams out there. I would like to take part in your surveys. I would really like to join. I live in Slovenia. want to be part of the survey team. I will be privileged to work as a survey team. Kindly allow me to join….Looking forward to the learning expierence. I want to be apart of your team. I’m interested in doing surveys. Please send email to me on how to go about in signing up for the surveys. Hi Alison, simply go to this page and select “Join Now”. Takes only a few minutes to register, and it’s free! Hello Enrique, to join go to this page and select “Join Now”. Cheers! Hi Jose, to be eligible for selection, select the Join Now link on this page and complete the form provided. That will get you in the database and as studies come up for which you might qualify, we will contact you via email. Great! Deon, go to this page and select “Join Now” to register. Hi Michael, I can’t guarantee that you’re going to be selected, but to be eligible, you can register onthis page, just click on the “Join Now” button on that page. Good luck! Hi Marlene, everyone can join for free, just tell us a bit about yourself when you select the Join Now link on this page. As studies come up, we look for panel members who might qualify. If we think you might be eligible, we’ll send you an email. If you do qualify and participate in a research study, you will receive cash for your time and opinions. Good luck! Hi John Paul, we’d love to have you. Just go to this page and select “Join Now” to register. Cheers! Szamosi, everyone can join! Click here and select the “Join Now” button to register. Cheers! Samantha, hi! You can register in the panel by creating a profile so we know more about you. If a study comes up for which you might qualify, we’ll send you an email with more information. To register, simply go to this page and select “Join Now”. Good luck! Tiyapo (great name, btw), to register yourself in the panel, simply go to this page and select the “Join Now” link. Cheers! Hi Cesar, membership is free and takes just a few minutes. Visit this page and select “Join Now”. Once you complete your member profile we’ll be able to send you research opportunities for which you might qualify. Cheers! Hi Marlena! Becoming a member is really easy, just go to this page and select the big “Join Now”. You’ll create a private member profile which will give us an idea what research studies might be a good fit for you. Good luck! Yes you can, Anne 🙂 To participate in research studies, simply register online onthis page. Cheers! We don’t discriminate, you are invited to join – it’s free and takes just a few minutes to register. Once you create your member profile, we’ll be able to match you up with research study opportunities that pay cash. Select “Join Now” on this page to begin. Cheers! Thanks for your interest To register, simply go to this page and select “Join Now”. Cheers! Hi Elma, joining is free and easy! On this page select “Join Now” to create your member profile. Cheers! Hello Kemueli, we’re always looking for panelists from around the world, register and you might get an email with an opportunity to participate in research. Go to this page and select “Join Now” to register. Cheers! Join the InsideHeads Researc hPanel by going to this page and clicking on the orange “Join Now” link. Good luck! We’re for real, are you? 😉 Kano, I see you’re in Norway, we are actually looking for participants in your area for a study this month! To register and be eligible, go to this page and select the big orange JOIN NOW link. Cheers! Fatma, thanks for your interest. We have studies with residents of Egypt coming up next month. Please register to be eligible by going to this page and selecting the big orange JOIN NOW link. Cheers! Hi! Definitely register, Jamaica is an area from which we recruit often. Go to this page and select the big orange JOIN NOW link. Cheers! Good day, Bermuda is another area from which we seek research participants often. To register and be eligible to receive opportunities, go to this page and select the big orange JOIN NOW link. Cheers! Hi Cherry, to join go to this page and select the JOIN NOW link. We could use more panelists from the Philippines! It takes just a few minutes and once registered, you’ll only get an email from us if we think you might qualify to participate in a research study. Good luck! Hello to Matseliso in Botswana! Thanks for your interest. To join go to this page and select the JOIN NOW link. It takes just a few minutes and it’s free to register. Hi Govind, please join, we need panelists from Jamiaca! Visit this page and select the JOIN NOW link to register. Cheers! Tashalee, good luck! To join and be eligible to receive invitations to participate in research studies, go to this page and select the JOIN NOW link. Cheers! Hi Virgilio, to join go to this page and select the JOIN NOW link. Good luck! Hi Robert, did you join? Please register if you haven’t done so already by going to this page and selecting the JOIN NOW link. Thanks! Hello Constance, we would love to have you as part of our research panel. To join, simply visit this page and select the JOIN NOW link. In just a few minutes you’ll be in the database and eligible to receive opportunities to participate. Hi Philip, did you register? We can always use an opinion from Singapore! Go to this page and select the JOIN NOW link to register and create your member profile. As studies come up that you may qualify for, we’ll send you an email with more info. Cheers! Hi Mechelle, thanks for your interest. To join the InsideHeads Online Research Panel, go to this page and select the JOIN NOW link. Once you create your member profile, we’ll be able to contact you as research studies come up for which you might qualify. Cheers! Hi Velma, thanks for your interest. Joining the panel is free and takes just a few minutes. Go to this page and select the JOIN NOW link to get started. Cheers! Your acceptance for my application to be one of your member will be appreciated. I’d like to give your panel a try. Get me started. I hope that I can work with you?!!! I would love to be a part of your team, been waiting to make my opinions count. I would like to do surveys? I can’t wait to be part of your research team. please sign me up. I’ll be a loyal member. I would like to be part of the research team. Please let me join your research team.. Please let me join your research team.My sincerly. Hi Rodilio, to join select the JOIN NOW link on this page here: Good luck! Thomas, joining is quick and easy, just select the JOIN NOW link on this page here: Cheers! Have you registered? Easy and quick, go to this page: Good luck! Hello friends I want to be part of your group and help to solve other peoples problems. I would be very interested in being a part of the team. I would like to join the research team. may I joined your awesome panel? I hope to be a part of your online.survey team. Thank you! I would love to join your team. It is first time for me to know about the name of InsideHeads.. i think the popularity of the company can be improved via making of video/short movie and paper advertsement on bus station. I would like to take part in paid surveys. I am interested in many things, I can probe everything. I would like to be a team member. I am willing to join ! what are the benefits of inside heads? What are the benefits of inside heads, how how do they reach the the subscriber? I would like to join. maybe I can be useful. Ich wäre gern Teil Ihres Forschungsteams. Deseo unirme a insideheads.com para poder participar en las encuestas y cualquier otro estudio en el cual mi opinión pueda se útil. Excelente, estamos dispuestos a participar. Want to join the panel and will be glad if am selected. I need to experience the paid survey lifestyle from within my country Zambia. It will be exciting to be a member of your team, sign me up please. Please make me a part of your team. Quisiera ser parte de su equipo, soy de El Salvador. I’m looking forward to becoming a part of your panel. I would please like to join your research team. I will be happy to join and participate in your surveys for cash. Thank you for this opportunity, William Cole. I believe could be an asset to you orginazation. I would like very much to learn more about your business and your surveys. Hi Jude, I appreciate your time and hope to place you in a research study soon! Please visit http://www.insideheads.com/panel/ and register yourself. Hi Mervat, I appreciate your time and hope to place you in a research study soon! Please visit http://www.insideheads.com/panel/ and register yourself. Hi Jeanette, My name is Maggie and I’m the Panel Manager for InsideHeads. We have several research studies on the horizon in which you may qualify to participate based on your profile. If you are interested in joining the InsideHeads Research Panel, it’s free and takes just a few minutes. Once registered in our database, we’ll be able to contact you as studies come up. I can’t guarantee your selection, but I can assure you I will only notify you of good leads. I appreciate your time and hope to place you in a research study soon! Please visit http://www.insideheads.com/panel/ and register yourself. Hi Mamta, I appreciate your time and hope to place you in a research study soon! Please visit http://www.insideheads.com/panel/ and register yourself. Hi Helanca, I appreciate your time and hope to place you in a research study soon! Please visit http://www.insideheads.com/panel/ and register yourself. Hi Jose, I appreciate your time and hope to place you in a research study soon! Please visit http://www.insideheads.com/panel/ and register yourself. Hi Willard, I appreciate your time and interest in taking up the research. I hope to place you in a research study soon! Please visit http://www.insideheads.com/panel/ and register yourself. Hi William, I appreciate your time and interest in taking up the research. I hope to place you in a research study soon! Please visit http://www.insideheads.com/panel/ and register yourself. Hi Pilar, I appreciate your time and interest in taking up the research. I hope to place you in a research study soon! Please visit http://www.insideheads.com/panel/ and register yourself. Hi Karl, I appreciate your time and interest in taking up the research. I hope to place you in a research study soon! Please visit http://www.insideheads.com/panel/ and register yourself. Hi Camelia, I appreciate your time and interest for participating in our research studies. I hope to place you in a research study soon! Please visit http://www.insideheads.com/panel/ and register yourself. Hi Mwandu, I appreciate your time and interest for participating in our research studies. I hope to place you in a research study soon! Please visit http://www.insideheads.com/panel/ and register yourself. Hi Linda, I appreciate your time and interest for participating in our research studies. I hope to place you in a research study soon! Please visit http://www.insideheads.com/panel/ and register yourself. Hi Rowena, I hope to place you in a research study soon! Please visit http://www.insideheads.com/panel/ and register yourself. Hi Nandi, I appreciate your time and interest for participating in our research studies. I hope to place you in a research study soon! Please visit http://www.insideheads.com/panel/ and register yourself. Thanks Mwangi, If you are interested in participating in our research study, please visit http://www.insideheads.com/panel/ and register yourself. Hi Michele, Sure, I hope to place you in a research study soon! Please visit http://www.insideheads.com/panel/ and register yourself. Hi Gaudy, I appreciate your time and interest for participating in our research studies. I hope to place you in a research study soon! Please visit http://www.insideheads.com/panel/ and register yourself. Hi Cynthia, I appreciate your interest for participating in our research. I hope to place you in a study soon! Please visit http://www.insideheads.com/panel/ and register yourself. Hi Camelia, I appreciate your time and interest for participating in our research. I hope to place you in a study soon! Please visit http://www.insideheads.com/panel/ and register yourself. Hi Mwandu, Sure, I hope to place you in a study soon! Please visit http://www.insideheads.com/panel/ and register yourself. Hi Linda, Sure, I hope to place you in a study soon! Please visit http://www.insideheads.com/panel/ and register yourself. Hi Rowena, Sure, I hope to place you in a study soon! Please visit http://www.insideheads.com/panel/ and register yourself. Hi Nandi, Sure. I hope to place you in a study soon! Please visit http://www.insideheads.com/panel/ and register yourself. Hi Ramadhan, I appreciate your time and interest for participating in our research. I hope to place you in a study soon! Please visit http://www.insideheads.com/panel/ and register yourself. Hi Subramani, I appreciate your time and interest for participating in our research. I hope to place you in a study soon! Please visit http://www.insideheads.com/panel/ and register yourself. Hi Vereen, I appreciate your time and interest for participating in our research. I hope to place you in a study soon! Please visit http://www.insideheads.com/panel/ and register yourself. Hi Jackson, Please visit http://www.insideheads.com/panel/ and register yourself. Hi Cynthia, Sure, Please visit http://www.insideheads.com/panel/ and register yourself. Hello, I appreciate your time and interest for participating in our research. I hope to place you in a study soon! Please visit http://www.insideheads.com/panel/ and register yourself. Hi Abdul, I appreciate your time and interest for participating in our research. I hope to place you in a study soon! Please visit http://www.insideheads.com/panel/ and register yourself. Hi Anisah, Sure, Please visit http://www.insideheads.com/panel/ and register yourself. Hi Gifty, I appreciate your time and interest for participating in our research. I hope to place you in a study soon! Please visit http://www.insideheads.com/panel/ and register yourself. Hi Claudio, Sure, I hope to place you in a study soon! Please visit http://www.insideheads.com/panel/ and register yourself. Hi Hannelie, Sure, I hope to place you in a study soon! Please visit http://www.insideheads.com/panel/ and register yourself. Hi Bonis, Sure, I hope to place you in a study soon! Please visit http://www.insideheads.com/panel/ and register yourself. Hi Malek, I appreciate your time and interest for participating in our research. I hope to place you in a study soon! Please visit http://www.insideheads.com/panel/ to join for free. Hi Hermencia, I appreciate your time and interest for participating in our research. I hope to place you in a study soon! Please visit http://www.insideheads.com/panel/ to join for free. Hi Terry, I appreciate your time and interest for participating in our research. I hope to place you in a study soon! Please visit http://www.insideheads.com/panel/ to join for free. Hi Roberto, I hope to place you in a study soon! Please visit http://www.insideheads.com/panel/ to join for free. Hi Terry, Please visit http://www.insideheads.com/panel/ to join for free. Hi Abdul, I appreciate your time and interest for participating in our research. I hope to place you in a study soon! Please visit http://www.insideheads.com/panel/ to join for free. Hello Thailand: Please visit http://www.insideheads.com/panel/ to join for free. Hi Anup, I appreciate your time and interest for participating in our research. I hope to place you in a study soon! Please visit http://www.insideheads.com/panel/ to join for free. Hi Elvira, I appreciate your time and interest for participating in our research. I hope to place you in a study soon! Please visit http://www.insideheads.com/panel/ to join for free. Hi Leonida, I appreciate your time and interest for participating in our research. I hope to place you in a study soon! Please visit http://www.insideheads.com/panel/ to join for free. Please visit http://www.insideheads.com/panel/ to join for free. Hi Terry, I hope to place you in a study soon! Please visit http://www.insideheads.com/panel/ to join for free. Hi Abdul, I hope to place you in a study soon! Please visit http://www.insideheads.com/panel/ to join for free. Hi Elvira, I hope to place you in a study soon! Please visit http://www.insideheads.com/panel/ to join for free. Hi Alma, I hope to place you in a study soon! Please visit http://www.insideheads.com/panel/ to join for free. Hi Jean, I appreciate your time and interest for participating in our research. I hope to place you in a study soon! Please visit http://www.insideheads.com/panel/ to join for free. Hi Clement, Please visit http://www.insideheads.com/panel/ to join for free. We have several research studies on the horizon in which you may qualify to participate based on your profile. If you are interested in joining the InsideHeads Research Panel, it’s free and takes just a few minutes. You will be paid for each study that you take with us. Once registered in our database, we’ll be able to contact you as studies come up. I appreciate your time and interest for participating in our research. I hope to place you in a study soon! Please visit http://www.insideheads.com/panel/ to join for free. Hi Tshepo, We have several research studies on the horizon in which you may qualify to participate based on your profile. If you are interested in joining the InsideHeads Research Panel, it’s free and takes just a few minutes. You will be paid for each study that you take with us. Once registered in our database, we’ll be able to contact you as studies come up. I appreciate your time and interest for participating in our research. I hope to place you in a study soon! Please visit http://www.insideheads.com/panel/ to join for free. Hi Huynh, Sorry for delay in responding you. I hope to place you in a study soon! Please visit http://www.insideheads.com/panel/ to join for free. Hi Nthiba, I appreciate your time and interest for participating in our research. I hope to place you in a study soon! Please visit http://www.insideheads.com/panel/ to join for free. Hi Esther, I appreciate your time and interest for participating in our research. I hope to place you in a study soon! Please visit http://www.insideheads.com/panel/ to join for free. Hi Louise, I appreciate your time and interest for participating in our research. I hope to place you in a study soon! Please visit http://www.insideheads.com/panel/ to join for free. Hi Diana, I appreciate your time and interest for participating in our research. I hope to place you in a study soon! Please visit http://www.insideheads.com/panel/ to join for free. Hi Janice, I hope to place you in a study soon! Please visit http://www.insideheads.com/panel/ to join for free. Thank you for your suggestion, we will definitely think over it. I hope to place you in a study soon! Please visit http://www.insideheads.com/panel/ to join for free. Hi Liziwe, I hope to place you in a study soon! Please visit http://www.insideheads.com/panel/ to join for free. Hi Anisah, I appreciate your time and interest for participating in our research. I hope to place you in a study soon! Please visit http://www.insideheads.com/panel/ to join for free. Hi Subramani, I appreciate your time and interest for participating in our research. I hope to place you in a study soon! Please visit http://www.insideheads.com/panel/ to join for free. Hi Willuam, I appreciate your time and interest for participating in our research. I hope to place you in a study soon! Please visit http://www.insideheads.com/panel/ to join for free. Hi Helanca, I appreciate your time and interest for participating in our research. I hope to place you in a study soon! Please visit http://www.insideheads.com/panel/ to join for free. Hi Mervat, I appreciate your time and interest for participating in our research. I hope to place you in a study soon! Please visit http://www.insideheads.com/panel/ to join for free. I am mechanical engineer in the field of aviation , with experience more than 30 years . I would like to join your research team. I feel I can make a valuable contribution to your research. If you guys are as passionate and sincere about what you do, then I would be honored to join your team. I would like to participate in your next research on live market studies in Colombia. Hi Dumar, I appreciate your time and interest for participating in our research. I hope to place you in a study soon! Please visit http://www.insideheads.com/panel/ to join for free. Hi Bhashini, I appreciate your time and interest for participating in our research. I hope to place you in a study soon! Please visit http://www.insideheads.com/panel/ to join for free. Sounds very interesting! I would love to be a part of this team! I enjoy using my brains!! want to be part of the research team! Me interesa participar en equipos de investigación. Hello: I appreciate your time and interest for participating in our research. I hope to place you in a study soon! Please visit http://www.insideheads.com/panel/ to join for free. Good morning, Mel, thanks for your interest. Jennifer Dale will reach out to you via email directly. Yo deceo hacer parte del grupo de investigacion. Want to join your research team to be among the best researcher in the world. Which topic do we comment or participate in? I would like to join your online marketing research team. I am looking forward to joining the online research marketing surveys. Hola, Angel. To sign-up and become a member of the InsideHeads Research Panel, go to http://www.insideheads.com/panel and select the Join Now button on the page. It’s free and takes just a few minutes to register. Cheers! Hola Marcela 🙂 To sign-up and become a member of the InsideHeads Research Panel, go to http://www.insideheads.com/panel and select the Join Now button on the page. It’s free and takes just a few minutes to register. Buenas dias! Good day, Janine, thanks for your interest. To sign-up and become a member of the InsideHeads Research Panel, go to http://www.insideheads.com/panel and select the Join Now button on the page. It’s free and takes just a few minutes to register. Cheers! Hi Lee, to sign-up and become a member of the InsideHeads Research Panel, go to http://www.insideheads.com/panel and select the Join Now button on the page. It’s free and takes just a few minutes to register. While we can’t guarantee you’ll be selected to participate in a research study, we do pay respondents who qualify and participate (rates vary by study). Good luck! Hi Rob, to sign-up and become a member of the InsideHeads Research Panel, go to http://www.insideheads.com/panel and select the Join Now button on the page. Cheers! Hi Renalyn, everyone can join, and it’s free! To sign-up and become a member of the InsideHeads Research Panel, go to http://www.insideheads.com/panel and select the Join Now button on the page. Cheers! Hi Christian, are a member of the InsideHeads panel? From that database we seek participants for online research studies. To sign-up and become a member of the InsideHeads Research Panel, simply go to http://www.insideheads.com/panel and select the Join Now button on the page. Once you’re a member, we’ll contact you if we believe you might qualify for a particular study. If you do qualify, and participate, you’ll be compensated for your time and opinions (the amount of your honorarium for participating will vary, but always will be revealed in the email you receive and the online screening questionnaire). Good luck! Hi Monique, of course you can! It’s free and open to everyone. To sign-up and become a member of the InsideHeads Research Panel, go to http://www.insideheads.com/panel and select the Join Now button on the page. Enjoy! Hi Nilliam, to become a member of the InsideHeads Research Panel, go to http://www.insideheads.com/panel and select the Join Now button on the page. It’s free and takes just a few minutes to join. InsideHeads will send you a confirmation email at first, then as research studies come up, InsideHeads will email you with a link to more information and a screening questionnaire to see if you qualify. If you qualify and participate in a research study with InsideHeads, you’ll receive cash for sharing your time and opinions. Amounts paid vary by study, but will always be clear in the email you receive from InsideHeads. Cheers! Hi Erick, to join the InsideHeads Research Panel and be invited to participate in online studies, go to http://www.insideheads.com/panel and select the Join Now button. Cheers! Hi Emerson, thanks for your interest. To join the InsideHeads Research Panel, go to http://www.insideheads.com/panel and select the Join Now button about halfway down the page. Joining is free. As research studies come up, InsideHeads will email you with a link to more information and a screening questionnaire to see if you qualify. If you qualify and participate in a research study with InsideHeads, you’ll receive cash for sharing your time and opinions. Amounts paid vary by study, but will always be clear in the email you receive from InsideHeads. Cheers! Hola Yacid, to become eligible to participate in InsideHeads online focus groups, I encourage you to join the InsideHeads Research Panel at http://www.insideheads.com/panel. Simply click on the Join Now button and complete the form provided. As research studies come up for which you may qualify, InsideHeads will email you with a link to more information. Good luck! Hi Irma, thanks for your interest. To join the InsideHeads Research Panel, go to http://www.insideheads.com/panel and select the Join Now button on the page. It’s free and takes just a few minutes to register. Cheers! Marjorie, have you joined the InsideHeads panel yet to be eligible? To become a member of the InsideHeads Research Panel, go to http://www.insideheads.com/panel and select the Join Now button. Hi Yesenia, are you registered as a member of the InsideHeads Research Panel? To be eligible to participate in research studies, go to http://www.insideheads.com/panel and select the Join Now button on the page. It’s free and takes just a few minutes to register. Cheers! Good afternoon, Artur, did you register? To join the InsideHeads Research Panel, simply select the Join Now button at http://www.insideheads.com/panel. It takes just a few minutes to join and doesn’t cost anything to be considered. Best! Hi Evon, thanks for your interest in joining the InsideHeads Research team. Have you registered yet? Select the Join Now link at http://www.insideheads.com/panel and you’ll be a member of the panel in just a few minutes! From there, InsideHeads first emails you a member confirmation, then as research studies come up, InsideHeads can email you with more information to qualify. Good luck! Hi Tina, thanks for you’re interest in joining the InsideHeads Research Panel! To join, go to http://www.insideheads.com/panel and select the Join Now button to be taken to the registration page. Once complete, you’ll receive a confirmation email from InsideHeads, then as research studies come up for which you might qualify, you’ll receive emails with links to more info. If you qualify and participate in a research study with InsideHeads, you will always receive some kind of reimbursement (usually cash) in exchange for sharing your time and opinions. Good luck! Hey Luz, to join the InsideHeads Research Panel, go to http://www.insideheads.com/panel and select the Join Now button on the page. Have fun! I understand what you all are offering, therefore I will like to be apart of it. Hi Gerardo, thanks for your interest. Have you joined the InsideHeads panel yet? It’s free. Just go to this page and select Join Now to complete the short online form. To join the InsideHeads panel, go to this page and select Join Now. Good luck! Hi Lisa, to participate in research studies with InsideHeads, go to this page, select Join Now, then complete the short form. Hi Teneisha, to be part of the InsideHeads online research panel, select the Join Now button on this page! Hi John, have you registered? You can join the InsideHeads panel for free, just select the Join Now button on this page! Good afternoon Gwendolina, simply select the Join Now button on this page. Cheers! To join the InsideHeads Research Panel, go to this page and select the Join Now button. Good luck! You can incorporate me into your programme if I qualify.It is beneficial and educative. Would love to become a part of your team, to participate in some exciting surveys and make some money thank you in advance. Would like to join your panel. Am disabled need work m something to do……thank you!?? I want to join in. Kindly incorporate me so that I can receive your surveys. Hi Theresa, are you registered as a member of the InsideHeads Research Panel? To be eligible to participate in research studies, go to http://insideheads.com/panel/ and select the Join Now button on the page. It’s free and takes just a few minutes to register. Cheers! Hi Henrietta, are you registered as a member of the InsideHeads Research Panel? To be eligible to participate in research studies, go to http://insideheads.com/panel/ and select the Join Now button on the page. It’s free and takes just a few minutes to register. Cheers! Hi Paul, are you registered as a member of the InsideHeads Research Panel? To be eligible to participate in research studies, go to http://insideheads.com/panel/ and select the Join Now button on the page. It’s free and takes just a few minutes to register. Cheers! Hi Llewellyn, are you registered as a member of the InsideHeads Research Panel? To be eligible to participate in research studies, go to http://insideheads.com/panel/ and select the Join Now button on the page. It’s free and takes just a few minutes to register. Cheers! Hi Mary, are you registered as a member of the InsideHeads Research Panel? To be eligible to participate in research studies, go to http://insideheads.com/panel/ and select the Join Now button on the page. It’s free and takes just a few minutes to register. Cheers! Hi Johannes, are you registered as a member of the InsideHeads Research Panel? To be eligible to participate in research studies, go to http://insideheads.com/panel/ and select the Join Now button on the page. It’s free and takes just a few minutes to register. Cheers! Hi Lynn, are you registered as a member of the InsideHeads Research Panel? To be eligible to participate in research studies, go to http://insideheads.com/panel/ and select the Join Now button on the page. It’s free and takes just a few minutes to register. Cheers! Hi Allan, Sure, are you registered as a member of the InsideHeads Research Panel? To be eligible to participate in research studies, go to http://insideheads.com/panel/ and select the Join Now button on the page. It’s free and takes just a few minutes to register. Cheers! Hi Ifran, Sure, are you registered as a member of the InsideHeads Research Panel? To be eligible to participate in research studies, go to http://insideheads.com/panel/ and select the Join Now button on the page. It’s free and takes just a few minutes to register. Cheers! Hi Longinus, Sure, are you registered as a member of the InsideHeads Research Panel? To be eligible to participate in research studies, go to http://insideheads.com/panel/ and select the Join Now button on the page. It’s free and takes just a few minutes to register. Cheers! Hi Angelica, Sure, are you registered as a member of the InsideHeads Research Panel? To be eligible to participate in research studies, go to http://insideheads.com/panel/ and select the Join Now button on the page. It’s free and takes just a few minutes to register. Cheers! Hi Diana, Sure, are you registered as a member of the InsideHeads Research Panel? To be eligible to participate in research studies, go to http://insideheads.com/panel/ and select the Join Now button on the page. It’s free and takes just a few minutes to register. Cheers! Hi Okagbuo, Sure, are you registered as a member of the InsideHeads Research Panel? To be eligible to participate in research studies, go to http://insideheads.com/panel/ and select the Join Now button on the page. It’s free and takes just a few minutes to register. Cheers! Hi Patrice, Sure, are you registered as a member of the InsideHeads Research Panel? To be eligible to participate in research studies, go to http://insideheads.com/panel/ and select the Join Now button on the page. It’s free and takes just a few minutes to register. Cheers! Hi! I’m interested in this job and I want to be a part of your team. Hello Cielo, thanks for your interest. We can’t guarantee your selection, but if you join the InsideHeads Research Panel, you’ll be eligible to take screening questionnaires that determine your qualifications for paid research studies. Go to http://www.insideheads.com/panel and select the Sign Up link. Good luck! Hi Ed, Sure, are you registered as a member of the InsideHeads Research Panel? To be eligible to participate in research studies, go to http://insideheads.com/panel/ and select the Join Now button on the page. It’s free and takes just a few minutes to register. Cheers! Hi Jessenia, Do you wish to register as a member of the InsideHeads Research Panel? To be eligible to participate in research studies, go to http://insideheads.com/panel/ and select the Join Now button on the page. It’s free and takes just a few minutes to register. Cheers! You just have to go to http://insideheads.com/panel/ and select the Join Now button on the page using your new email address. It’s free and takes just a few minutes. Cheers! I want to be a part of research team! Recently!